Ignorance [ig-ner-uhns] (noun) : The state or fact of being ignorant; lack of knowledge, learning, information, etc. If there’s a topic that really gets me fired up and ready to talk, it’s ignorance in people when they talk about evolution, creation, etc., and how it relates (or doesn’t relate) to Christianity. It’s one of my biggest pet peeves. If people could talk about those subjects and say, “hey, I don’t really know much about what evolution is, but from what I understand, it’s about monkeys turning into people”, I hope I’d at least be able to curb my outrage if they started to bash it in the following breath because at least I could reason that the person acknowledged that they don’t know what they’re talking about, bless ’em. However, nine times out of ten, the people I hear talking about it are people that I’m almost positive have done none of their own homework about the topic, and then spout off what they think it is and their opinions–which really just turn out to be all the other ignorant people’s beliefs because they haven’t researched it either. Last Sunday, I attended my parent’s church and heard a couple of remarks from the pastor about evolution, how it shouldn’t be taught in schools, creation is the only belief, and scientists (he did allow, “not all scientists”) push their own agendas. I will be addressing this below. Evolution: A process in which, over time, apes turned into humans. Contrary to an unfortunate popular belief, the definition of evolution does not say that monkeys turned into people, but this is just what I was taught–or rather not taught–when I was in grade school and in church. I daresay that’s what a lot of people believe evolution is, especially in the Bible belt of the USA. I will also say that scientists or Christians that are scientists/biologists do not only believe in evolution just because they want to “follow their own agenda”, which I suppose some people think of scientists doing because of their position of “scientific authority”. Charles Darwin, who developed the theory of evolution by natural selection, was scared about the implications his theory would have on what he and his family and actually a lot of his colleagues believed religiously (about God creating everything). It took him a long, long time to develop his theory and to even get it out into the public eye, which he only ended up doing because another scientist was about to get the scoop with a similar theory anyway. Case in point, scientists aren’t just making stuff up to mess with the local bodies of religion. If they are, then they do not make up the majority of the scientific community, and I can almost guarantee that they won’t have many colleagues that will want to review their papers for publishing, which will in turn reduce their credibility in the scientific community. But back to the implications Darwin’s theory would have. Obviously, the theory of evolution did and continues to create adverse feelings toward what Christians believe about the creation story found in Genesis. My answer to this conundrum is simple: believing in evolution and in God creating the world and everything in it doesn’t have to be mutually exclusive. Humans aren’t God; we don’t exactly know all the mechanisms of how everything works or even how they came into being. There are some questions science won’t ever be able to answer; in the same reasoning, there are some things in the Bible regular old humans will never fully be able to understand. Surely no Christian would make the claim that they know exactly how God was able to bring everything into existence–but are we never supposed to even question it? Our understanding of how things worked back at the time the Scriptures were written was, I daresay, not as advanced as today; why wouldn’t things be laid out and explained in a simpler description for people back then to be able to grasp those ideas? Furthermore, science does not prove or attempt to prove anything; that’s just not how science and the scientific method works. The scientific method is all about proving things false. To me, it seems that Christians get so worked up about evolution for one of two reasons: one, their faith is not strong enough to cope with how scientific developments might challenge them to look at the world that God created differently, or two, that they are ignorant about what evolution actually means. However, you can’t just pick and choose what science you want to believe based on whether or not it jives with you, but I won’t continue ranting on other topics as well (*climate change*, *the age of the Earth*, cough cough). If you have that attitude, then we might as well do away altogether with science and all of its breakthroughs that we’ve been enjoying. Evolution: the process by which species change over time. It arises from processes of selection that favor individuals having certain favorable traits over those lacking those traits. If anything is going to be taught in schools, it should be evolution and not creation. Evolution is science; creation is a part of religion. Evolution has been tested and can be tested–creation can’t! Like I said before, science doesn’t prove anything, but it does help narrow down what doesn’t support whatever hypothesis is put forward. So far, the theory of evolution by natural selection has withstood many tests and observations, even about organisms that have and are living in our own lifetime! We simply can’t do this with creation (unless we find a way to go back in time to whenever God created everything, in which case that means we’ve invented a Doctor Who Time And Relative Dimensions In Space (TARDIS) machine and my dreams have come true). I don’t believe creation should be taught in schools because we have this little thing in the Constitution about separation between church and state; if we favor one religion (Christianity) over other religions within the government, then we don’t truly have religious freedom and who’s to say the government wouldn’t impose another religion (that most of us don’t subscribe to) on the people and kids in schools? I want to tell you that contrary to what you’ve been told, you can be a Christian and still believe in evolution. Evolution is simply the best theory we have right now about organisms changing and adapting over time and it can be tested. As a Christian, you can still believe in the Bible and that God created all things; however, I don’t remember reading anywhere in there about the mechanism God used to create everything. I know evolution takes millions of years and the Bible says God achieved creation in days, but is everything in the Bible precisely literal? Maybe He dumbed it down for us because at that time we couldn’t fathom how big millions was (like when He explained to Abraham that his descendents would be as numerous as the grains of sand on a beach–He didn’t say “You’re gonna have billions of descendents” and Abraham would be all like, “Huh? Give me something physical I can understand!”). I’ve been asked if I believed whether or not God could have created everything in thousands of years–and I believe He could do whatever He wants; science’s conclusions on evolution and how old the Earth is could be completely wrong. However, that’s the best we as humans can do on figuring out what’s happening. If you believe in anything that science has discovered or done for us since we’ve been using it, you should at least concede that it’s not bad and we shouldn’t stop asking questions. And please, before you make comments against evolution as an authority figure in front of your congregation on Sunday morning, at least do your research or preface that you have no idea about what you’re talking about. Ignorance is not bliss, it’s just sad. Please check out my new travel blog at Uncaged Traveler and subscribe to the RSS feed as well to keep up with my latest travel escapades! Andy Warhol’s name is synonymous with pop art, a movement that began in the 1950s and used items from popular culture in different ways, sometimes out of context and sometimes as a representation of how images from (mainly) American consumerism affected and manipulated society. He was an American artist who lived from 1928-1987. Some of his more popular works include his rendering of the Campbell’s soup can and his portraits of celebrities with colorful backgrounds. I first learned about Warhol in one of the numerous mandatory and special elective art classes I took throughout middle school and high school alongside other definitive artists such as Seurat, Picasso, Van Gogh, and Dali; artists that were so instrumental to their own art movements and generations that nearly everyone who isn’t fluent in art history can probably conjure up an image of at least one of their major works. During my first semester of college, I took art appreciation–mainly as an easy elective–and further had major artists and their works drilled into my head. Being a huge art nerd, I naturally thrill over seeing these remarkable artists’ works in person. The last time I was able to do so was during my last trip to Chicago in 2010 when I visited the Art Institute of Chicago. I almost had to be dragged out of the place. 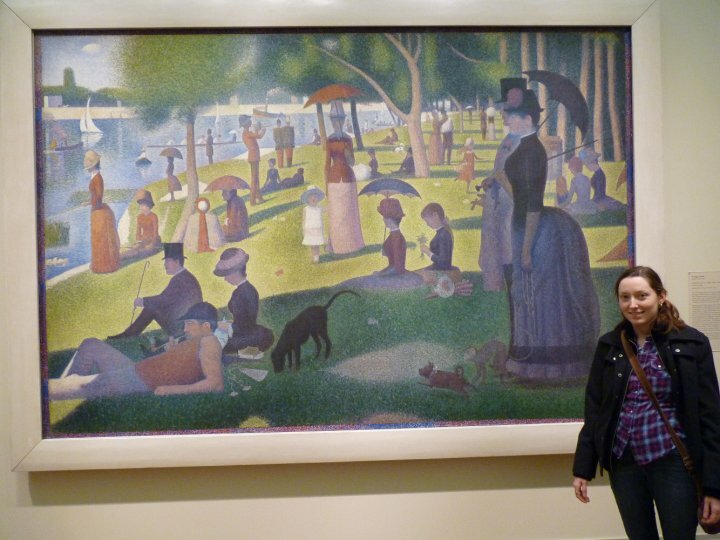 Me, drooling over George Seurat’s masterpiece, “A Sunday Afternoon on the Island of La Grande Jatte” at the Art Institute of Chicago. I made a reproduction of the work in middle school using Q-tips to represent the pointillism. Source: National Gallery of Art, Washington, D.C.
At the link above, you can also see a side-by-side picture of the actual front page of the August 23rd, 1956 paper, as well as Warhol’s reproduction. The National Gallery of Art actually had to get permission from my town’s newspaper to be able to use image in the exhibit, which my town took as an opportunity to get publicity. Can’t say I blame them; Princeton doesn’t have many notable claims to fame anyway. Besides, I’d rather have my town known for something in art history, even if it’s just as a commentary on social classes. The crudeness of the drawing seems to me like Warhol was trying out his idea for the Headlines series on random domestic local papers before advancing to more well-known national and international ones. An added more interesting bonus factoid is that my dad was born in the same week of the paper Warhol used! How did Warhol get a copy of the Princeton Leader? That’s a mystery we may never know. The Headlines exhibit was at the National Gallery of Art in Washington D.C. from September 25, 2011-January 2, 2012. The exhibit can currently be seen until May 13, 2012 at Museum für Moderne Kunst, Frankfurt. It will then be at Galleria nazionale d’arte moderna, Rome, from June 11–September 9, 2012, and at The Andy Warhol Museum, Pittsburgh, October 14, 2012–January 6, 2013. 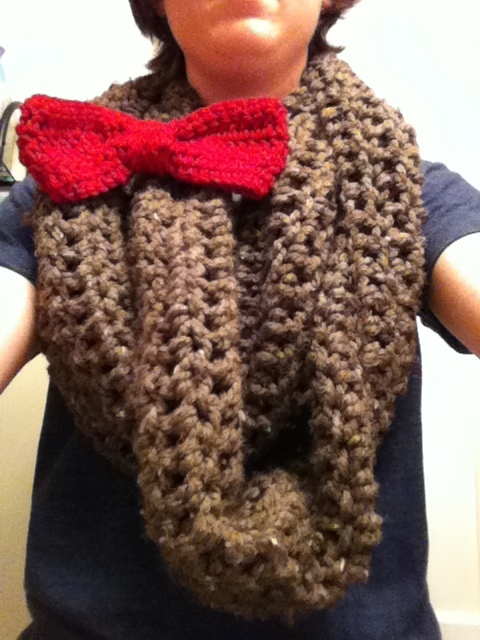 If someone happens to be reading this and actually sees it in person, please comment and let me know! I have less than two weeks left in Charleston. 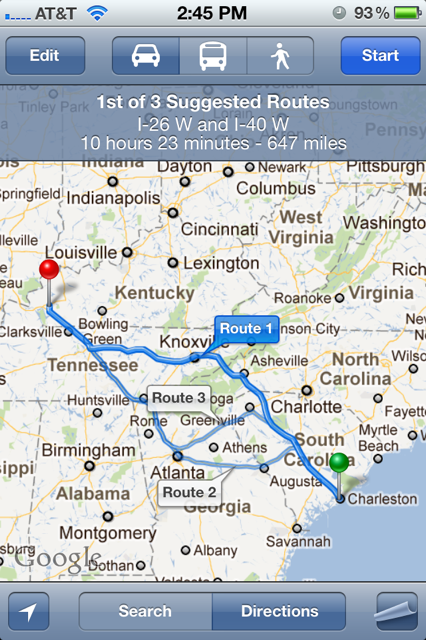 and roughly 312 hours until I pack up and move back to Kentuckyland. I do love Kentucky. I love my family and I am excited about being home for a few months. I’ll be able to see family and friends that I haven’t seen in a while (or never met before, like Shellie and Rob’s little Harper). It’s cliche to say, but I know that no matter how far I go and no matter how long I’m gone, I will always be welcome at home. That little old dot on the map in the western corner of Kentucky will always be my “home”. However, I have felt that for a long time the need to go, to explore, to do something with my life, something that I feel I can’t do in that little pocket of Kentucky. And for that reason, sometimes Kentucky doesn’t really feel like home. On the other hand, I sort of feel like Andrew in 2004’s Garden State. I don’t really know where my “home” is. Now, I don’t mean to say that to make me sound ungracious or that I never miss my family back in Kentucky or the familiarity of places I’ve lived (and if you know me at all, you know I’m nostalgic), but there’s a feeling that I haven’t come into my own yet, so I keep looking. Nomadic, more or less. Surely I’m not the only person who goes through this. I think your 20s especially are a time when you try to find where you fit and who you are. Moving back to my parent’s house in Kentucky temporarily is bittersweet. I will be sad to drive over the Connector, past Charleston harbor, and up I-26 one last time. I will miss the people who have been my Charleston family–The Christophers (Steve, Liz, Corinna, Sydney, and precious Luke), Jena and Patrick, my zombie/geek-loving/wine night friends (Jared, Niquie, Tessa, Lindsay, Chuck, and Tucker), my Coastal Community Church family (headed by Pastor Chris), any of the Grice marine biology people, my roommate the artist (Amanda), and some of the people I’ve befriended at the MG&C law firm (Bethany, Ashley, Julie, Catherine, Amanda J., Amanda B., Tee, Ashton, and Katie). After living in Charleston for three years, there are a lot of connections I have made that I will miss. And the FOOD! Oh my, the food. They don’t have the same variety back in Princeton like they do here, and that will be sad indeed. I will also miss the beach being a short drive from my house and movie nights with Disney marathons or zombie flicks or shows or books that only a few of my friends love to watch and talk about. I will miss the children. I have about four or so families that I’ve come to be the chosen babysitter for here. Most notably, my nanny charges, the Christopher children. Corinna, Sydney and Luke I will miss the most. I babysat for them last night while their parents had a date night. I’ve watched them grow up over the past year, especially Luke. 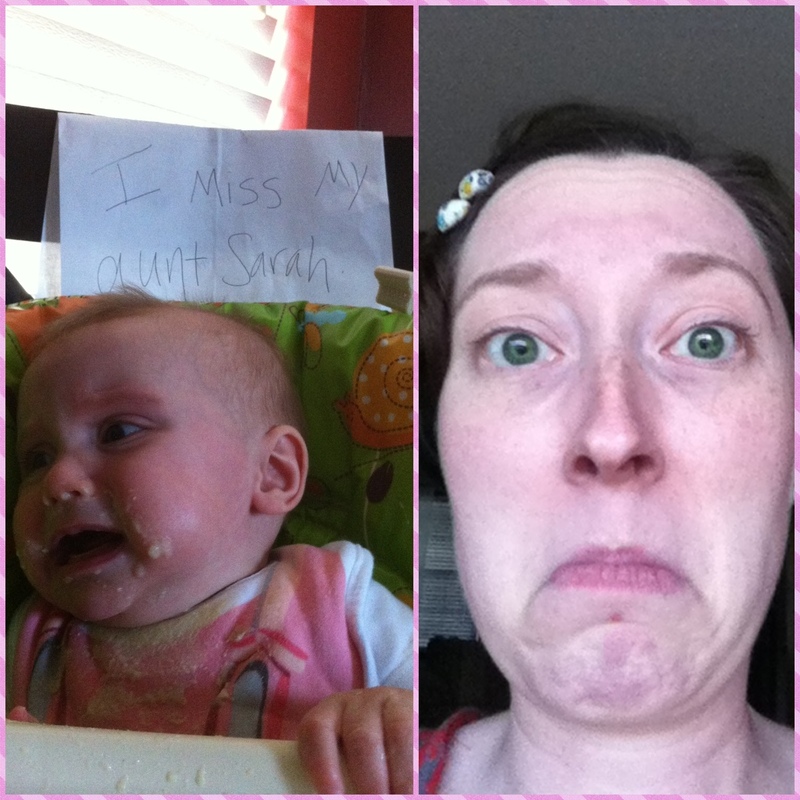 Babies grow up so, so fast. He was just pointing and grunting at things when I started and now we’re at the dinner table and he’s saying things like, “Napkin, please, Rah Rah.” GAH! He then proceeded to wipe down his entire body with the napkin, not just his hands. 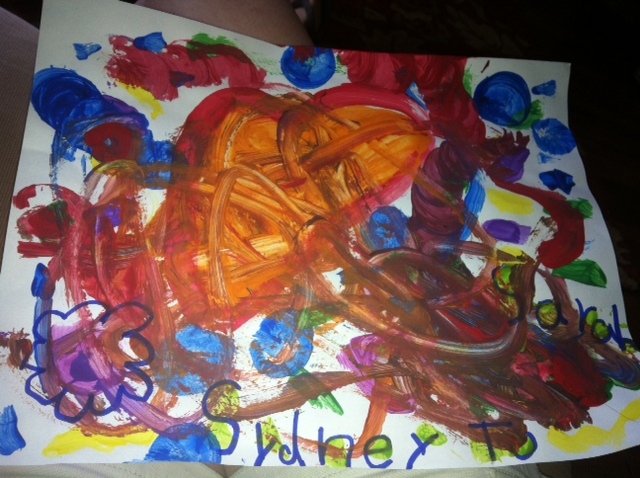 Sydney wanted to show me how much better she was at painting now, and painted me a picture. Corinna was playing a spy game and had to take our fingerprints on paper by dipping them in paint. Luke is now using big-kid toothpaste; instead him just brushing, he’s using the kind where he has to spit and swish water (which he did all over the bathroom). We had a “spa night” after Luke went to bed in which I gave them a facial and put cucumbers on their eyes and painted their nails green for St. Patrick’s Day. I asked them if they knew I was moving away from Charleston soon, and they did. I told them we could talk on the computer and see each other that way. Corinna said, “Yeah, but it’s not as good.” I could’ve cried, but I held it back. (I actually am now as I’m typing this). She led us in the “now I lay my down to sleep” prayer before they went to bed, as usual, with a “…God bless Daddy, Mommy, Corinna, Sydney, Luke, and Ms. Sarah, Amen.” They think of me as an extension of their family. How do I leave that?!? Maybe I can rationalize what I’m doing in my mind, and it is really what I want to do, but I don’t know how to explain that I want to find place and I want to travel to them. Hopefully Luke will still remember me; after I had stopped nannying for them and being there every day, he was mad at me the next time he saw me–he thought I abandoned him! Likewise, I can’t say enough about Jena and Pat. Jena has been my best friend since we both moved into the Grice dorms to start the marine biology program. She dragged me to social events even when I vehemently did not want to go because I am such a homebody. I got to share in being in Jena and Pat’s wedding last October. We’ve consumed copious amounts of coffee, wine, margaritas, bourbon, pie, and meat (since Pat is a vegetarian and hey, somebody has to eat that stuff). We’ve fan-girled together over British television and Sci-fi, both of us having similar likes and dislikes. We had a period where we would inadvertently dress alike. We complete each other’s sentences. We joke that we are the same person. Patrick rolls his eyes at us simultaneously. 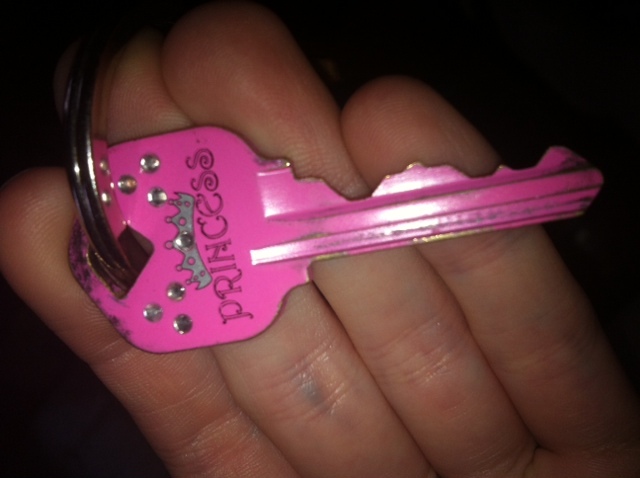 I have the pink Princess key to their house, not that I need it because I’m there almost as much as I’m at home. The Christopher’s, Jena, and Pat all let me celebrate my first Christmas away from home with them. 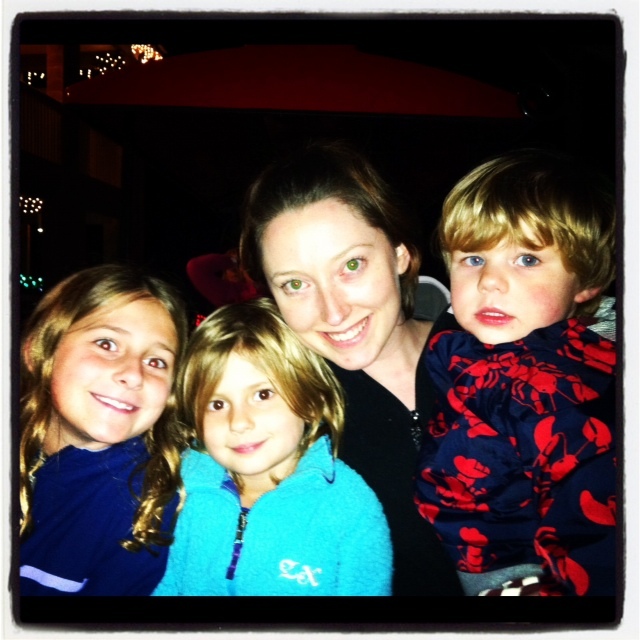 I missed my family and our traditions, but I knew I was home here too–because of them. But this particular chapter is ending, and a new one is starting soon. Sometimes life moves so fast that my brain and senses can hardly keep up and before I know it, I feel this part will fade into my memories of when I lived in Charleston. I will finish up my last week of work at MG&C this week, greet my Mom, Dad, Aunt, and Uncle when they arrive, and live it up in Charleston as much as I can before I head back to Kentucky. I hope to see all my Charleston family again soon. Recently, the younger sister of a girl I graduated high school with was involved in a bad car accident. I didn’t personally know her, but I had had several classes with her sister. My Facebook news feed has been blowing up all week from friends of the girl back home, asking people to pray for her. She was in the hospital for a while, fighting, but she passed away today. I’m not exactly sure what I want to write here, except that I pray for her family and two children she leaves behind. I was bothered by some of the statuses the friends were posting, saying that they weren’t religious, but to keep praying. I have nothing against these people, or what their beliefs may be. I can understand how one can be put off by “religion” in of itself, and therefore cast a horrible eye towards anyone proclaiming he or she practices that “religion”. The thing I found interesting, though, was that in their moment of uncertainty about what was going to happen to this girl–some who don’t really claim any certain belief about God–were asking for prayers. Don’t misunderstand, I believe this is a beautiful thing. My point is just this: why does it have to take something tragic to get people to run to Jesus? I mean, logically, yes it makes sense–because they didn’t realize the need for Him before. But it never fails. In whatever tragic situation you could dream of, there will always be people at the end of their rope who decide as a last resort to ask for some divine help. I just wish it didn’t take that; they don’t know what they’re missing. There is a God up there, who loves them and who has pursued them; a God over the whole universe, who wants a relationship with each of us; a God that lets us choose freely whether or not to follow Him. This all reminded me of that Regina Spektor song, “Laughing With God, “ every time I saw a post about this tragedy. Earlier in January, he announced that he was forming a committee to explore his potential candidacy for the President of the United States of South Carolina. Since Colbert could not legally run for office while still tied to his Super PAC, Jon Stewart, Comedy Central’s other political funny-man, “took over” Stephen’s Super PAC. The Super PACs’ name was also changed to, “The Definitely Not Coordinating with Stephen Colbert Super PAC”. Aside from his TV antics, Colbert was legitimately making a point about how the PAC system operates. Even though now he’s not “in control” of his PAC money per se–money that he raised for the exclusive purpose of promoting his own candidacy–Stewart, who is now in control of the PAC and friends with Colbert–can use it for basically the same means. (Aside: this is what actually happens). 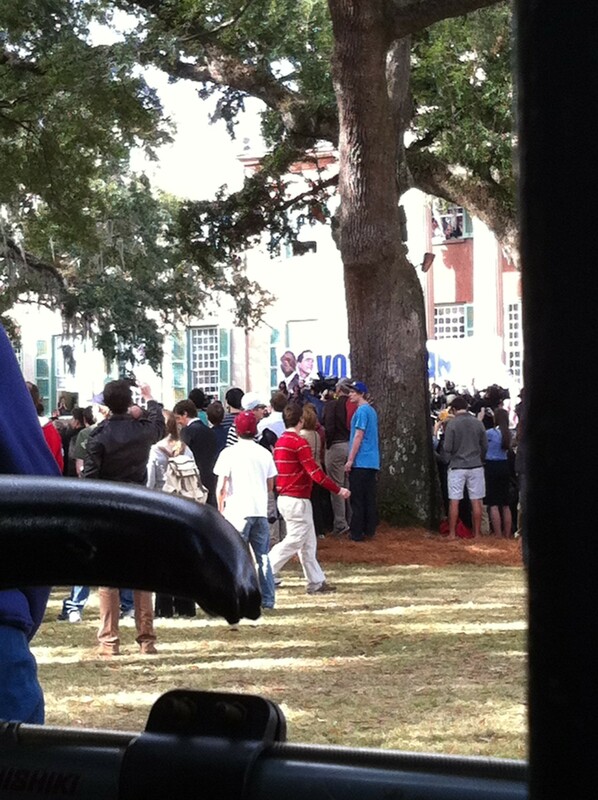 SOOOO with all of that background, I now come to what witnessed today: Stephen Colbert’s “Rock You Like a Herman Cain South Cain-olina Primary Rally” at the College of Charleston’s Cistern, January 20th 2012. 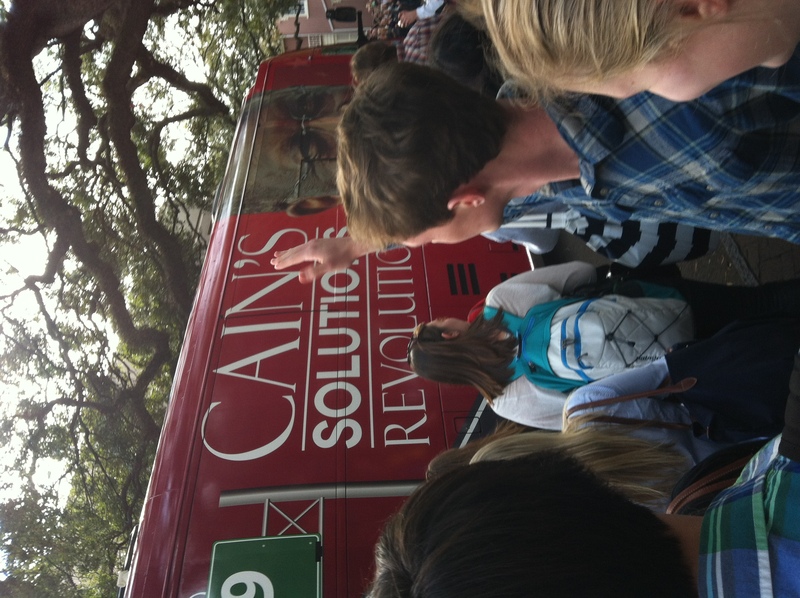 An anxious queue, consisting of mostly CofC college students, began gathering outside of the campus’ courtyard as early as 10am–the rally didn’t start until 1pm with doors opening at 12pm. Naturally, the line stretched from the Cistern on St. Philips Street down to busy Calhoun Street a couple of blocks away, spilling around the corner. I wasn’t able to line up early, as I had to work–fortunately at an office building literally just a block or so away. I took off at 12:45 for the rally; apparently the yard had reached its occupancy limit, and the remaining students and curious passers-by had to wait outside. Students climbed up to and held on to iron bars on top of the waist-high concrete perimeter that housed the Cistern yard. I peered in through the elevated iron bars, students’ legs, and around trees to get a glimpse of the stage where Colbert would make his appearance. The stage with the "Vote Cain" banner. You can see how far away I was. The stage at the far end of the yard held a gospel choir and a large banner with Cain and Colbert’s faces plastered across the top. talking about Charleston in general, “…and if this rally gets out of hand, at least you’ll be pepper sprayed in the nicest way possible. Even with his jokes, I think he let a little more of himself show through than he normally does, which was nice. He’s hilarious, and I love his show, but it was nice to be able to see him being more himself than having to sift through his TV personality’s sarcasm and jokes to figure out what he actually feels about issues. Herman Cain then took the stage and babbled on and on about how Washington is corrupt and obviously, since he had to drop out of the Presidential race, that change won’t come from the inside–it has to come from the outside, the people. Then it was “tea party” this and that and “don’t waste your vote on me tomorrow”…and then he started talking about Pokemon for some reason. I don’t know, I was a little far back, but I did hear him say what I thought was Pokemon…and my friend who was closer posted on Facebook that he actually sang the Pokemon song. At this point, I wondered whether or not I should leave. I was sincerely bored, and mainly wanted to just hear Colbert. He then urged the audience to be informed and to vote in the primary and the upcoming election and that “every vote counts”. At that time, I had to head back to work (boo), but left feeling a little more upbeat. Colbert is a not just a hilarious “extremely conservative” TV personality, but a talented, inspiring individual that uses his media power for good to bring flaws in our country’s political system to light. I venture to guess that many of my fellow college-aged audience members at today’s rally didn’t fully grasp everything that Stephen was talking about today; some probably don’t even get his sarcasm on his show and think he’s actually being serious when he says ridiculous things. I still remember that one time I had to explain to my ex-college roommate as we were watching his show that he wasn’t being serious. In fact, I know this just from what the students who were near me were saying. Even so, I hope that Colbert’s call for people to be more informed and to make their vote heard will cause people to stop and think about who they will cast their vote for in South Carolina’s primary tomorrow. I know I taking that a little more seriously now, even if all of the candidates are crooks.